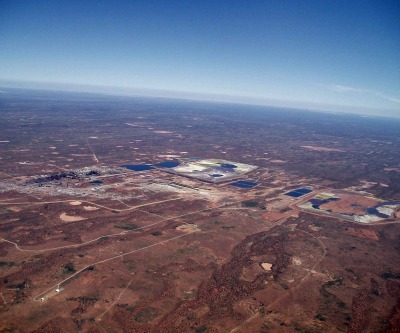 Aerial view of BHP's Olympic Dam. The sustained crash in uranium prices is forcing BHP Billiton (ASX,NYSE,LON:BHP), the world's largest mining company, to keep its mammoth $30 billion Olympic Dam mine expansion on hold, as the firm battles market conditions to keep current operations afloat. In an interview with Financial Review (pay wall), the company’s chief executive Andrew Mackenzie said that while BHP is searching for a technological breakthrough to allow the key expansion, it was unlikely to happen any time soon. BHP, which has a $16 billion capital spending program for fiscal 2014, announced Thursday it has priced a four-tranche $5 billion global bond to raise proceeds for "general corporate purposes." In August last year then-CEO Marius Kloppers cancelled plans for an expanded copper-uranium open-pit mine, blaming an overheated resources sector and the country's high-cost environment for the decision. The ambitious project in South Australia's outback is expected to become the world's largest uranium mine. It included the construction of 270km of powerlines, a 400 km pipeline, a new desalination plant and a 105km railway.